Sleeping with a CPAP mask on a regular pillow may not work out well. Thankfully, there are specially designed pillows for CPAP mask users. Like everything else, however, there are good CPAP pillows and bad ones. Our review of best pillow for CPAP will help you make the right choice, as would other information listed here. 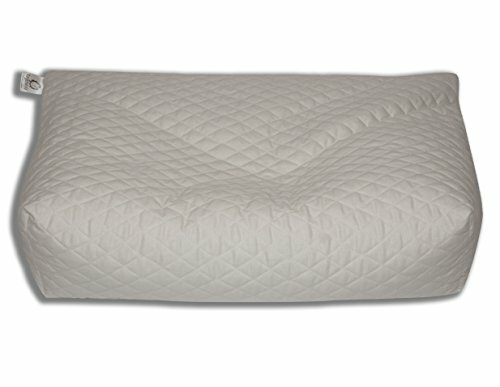 Is spending money on a CPAP pillow after you’ve already spent a considerable amount on the CPAP machine really worth it? A CPAP machine does not come cheap, and spending some more on a special pillow can, well, pinch a bit. Valid as this question is, it is not the first one you should be asking. Your first two questions should be these: Is my current pillow able to prevent CPAP mask leaks? Do I wake up refreshed in the morning? How to choose the best pillow for C.P.A.P. CPAP pillows come in different designs, thicknesses, and materials. These tips will help you pick the best one for yourself. Suitable to your sleeping position. 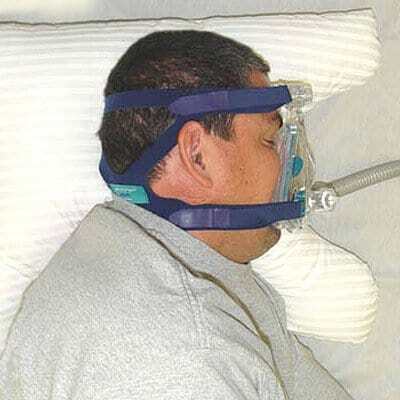 Many CPAP pillows are designed for side sleeping only, which is the most recommended sleeping position for sleep apnea patients using CPAP treatment. However, there are some which supports side as well as back sleeping. If you sleep on the back (which, by the way, is not a recommended position for CPAP mask users as we’ll see in the next section), you should opt for the second type. Keeps the mask in place and prevents mask leaks. If a pillow doesn’t provide these two features, it is not a CPAP pillow, regardless of what its product description says. As CPAP masks too come in different designs, it is not uncommon to find one pillow supporting a particular type of mask or a few types only. Therefore, ensure the selected pillow works with the type of mask you are using before buying it. In comparison to regular pillows, CPAP pillows are thicker at the edges. They are so to ensure that the mask and hose do not touch the mattress. Fluff the pillow. Place it between your hands and push it from both sides a few times. Try it, it works. Remove some stuffing if fluffing hasn’t softened the pillow adequately. Unstitch the seam, remove the stuffing, and stitch up the seam. Ensure you sew it up well; otherwise next morning you may find the pillow a lot thinner than you wanted it to be, and stuffing scattered all over the mattresses. Also do not throw the removed stuffing (you might need it if you have taken out too much stuffing or sometime later when the pillow has lost some of its firmness). Money back guarantee and warranty. Having both will be great, but the former is a must. In spite of your best efforts in checking the suitability of the product, it might turn out to be less than perfect. A money back guarantee in such a situation helps, and most major pillow manufacturers offer them. A warranty, on the one hand, insures you against design flaws, loss of shape, etc., and on the second hand tells that the manufacturer stands behind his product. Because each warranty clause is unique, read the warranty of the selected product to learn what all is included in it. Why you should avoid sleeping on your back if using a CPAP mask? Sleeping on the back can aggravate snoring and sleep apnea. In this position, gravity pulls down the soft tissues of your tongue into the back of your throat, worsening your sleep apnea. Moreover, turning and tossing from this position can make it difficult to avoid problems with the CPAP mask, even if you are using a special pillow under the head. Designed for CPAP, this pillow from Hudson Medical works for all three common sleeping positions: on the back, side, and stomach. In each position, the pillow can be positioned in such a way to ensure there is no obstruction of mask exhalation ports. The pillow is soft and comfortable to sleep upon. If you use a CPAP machine and find it difficult to stay sleep, you might want to give this CPAP pillow a try. However, some may find the pillow too fluffy. Removing a little stuffing will help. Another good thing is that a pillowcase is included, and it is machine washable. I prefer zip-off covers and this one is just that. Zip it off and toss it into the machine whenever you want to clean it. My only gripe with it is that the cover is not very smooth. I used a satin pillowcase instead of the original. This is a great choice for side sleepers because it allows the mask to rest comfortably, unlike many other CPAP pillows in which you feel the mask falling on to your face after some time. With that said, it might not work so nicely for users wearing a total face mask. Full face mask users, however, should be able to enjoy an interrupted sleep on it. The pillow is constructed really well, and is suitable for side and back sleepers—and, perhaps, even stomach sleepers. The memory foam contours your head and neck well, ensuring you don’t wake up with a neck wink. It uses a velour knit cover, which is comfortable and machine washable. Because it has a zippered closure, removing and putting it back is easy. Another good feature is a built-in tether. It helps reduce hose drop. There’s no information about it being hypoallergenic. Contact the manufacturer and check its suitability for you first if you suffer from asthma or are prone to allergies. This pillow is thick and thin and every level between the two. Confused? Well, The CPAPfit Pillow is a customizable pillow. You choose how thick you want it to be and the fill the pillow accordingly. The manufacturer has provided an instruction sheet with the pillow to help users decide how much filling they might need and the appropriate ration of hulls to foam for them. With that said, you might have to experiment a little to learn what’s the right thickness and hulls to foam ratio for you. For me, 75% full with 5:1 hulls to foam ration worked best. As the pillow is customizable and hulls are very moldable, you can create a niche for the CPAP mask to ensure it doesn’t pushes into your face while sleeping. All in all, this is a good CPAP pillow. The Core CPAP Pillow has a quilted side panel, which ensures that the mask can be comfortably placed on the side. When you sleep on it, you don’t feel that mask is being forced into the side of your face. With the mask remaining in the correct position all night, you can breathe better and sleep more deeply and for longer time. Uniquely designed, the pillow is meant for stomach and side sleepers. This pillow is equally comfortable on both sides. It provides good support to the head and neck. It comes with a fitted pillow case made of cotton. The surface is comfortable and not scratchy at all. One more good thing (at least for some customers) is that it is made in the USA. The product description doesn’t tell whether the core CPAP Pillow is hypoallergenic or not. Asthma sufferers might want to write to the manufacturer to inquire about this before buying the pillow. The SleePap Pillow is built for CPAP users who sleep on side or stomach. It keeps the mask in place well and you will not feel the mask coming onto your face. However, not all types of masks might work perfectly with it. I checked it with a full CPAP mask, and didn’t experience any problem. The pillow uses polyester filling and is a little on the firm side. Those who are used to soft, fluffy pillows may take a few nights to get used to it. 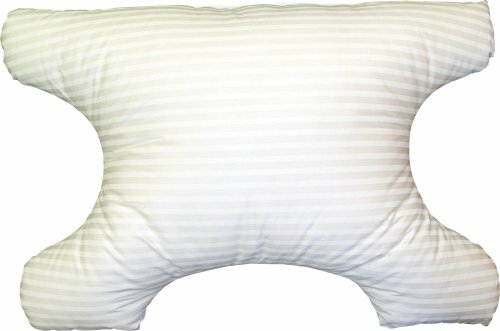 The SleePap Pillow uses a cotton cover. It is quite comfortable and soft. As the cover is removable and machine washable, washing it shouldn’t be a problem at all. Is it suitable for allergy sufferers? I can’t say, because there is no information about this. Contact the manufacturer to check this. This is a decent CPAP pillow for side and stomach sleepers, especially those who like their pillows firm.